Come December and most parts of the world are sure to be lapped up in a harsh, cold and snowy winter. Staying warm is surely a big challenge for everyone, and more so for the four-legged community and flighty creatures. With the temperatures plummeting and the streets turning cold and wet, we need to take care of our family members – our cherished pets. In other seasons, it’s easier to take your dog for a walk without thinking twice or have the windows stay open for a breeze of fresh air for your talking parrot. But an altogether different approach is required in the frosty climes. 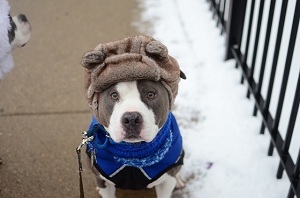 Read on to know how you can keep your pets warm and all alive and chirping in the tough winter. Many among us think that dogs are blessed with their own layering system. But not all dogs have thick layers of fur. There is every possibility that your dog may get extremely uncomfortable with the winter temperatures. That is when winter dog coats come handy. Keep in mind your pet’s breed while choosing one. Also, materials made from high quality along with superior workmanship surely make a difference and help the dog stay warm – be it in the house or outside. Many companies design their winter dog coats for unique fit, maximum durability and ease of movement keeping in mind the rigorous standards. Most dog owners love their dogs staying in their homes. But if your dog is an outdoors kind, see to it that you provide enough shelter from cold and uninviting situations. A warm and cozy kennel or sleeping area that is well protected from the snow and the wind is the first priority. Then consider the size – the dog house must provide enough room for your pet to move around in. But again small enough to preserve his body heat to warm it up. Don’t forget to raise his sleep board from the ground. Line it with old blanket or straw to keep it warmer. How do you clear your yard of twigs and branches? Rake them. Have a pet like a chipmunk or a reptile? Build a nice brush pile for them. It will prove a safe haven for the hibernating pets. See to it that you place it out-of-the-way corner of your house and try and place a food source near their abode to avoid the little creatures from losing their energy moving around to search for it. Layer up larger parts with the branches stacking loosely. Add leaves and grasses to craft nooks and crannies. Birds are warm-blooded. That means they can maintain their body temperature around a certain range even if the temperatures around them change. This maintenance of body temperature depends on the extent of heat the bird produces. To enhance their high metabolic rate, they need energy foods like seeds. Many companies that research in this aspect have come up with warmer seeds that offer essential fats. Some also provide a wheat free high energy mix that helps birds endure the winter. Ingredients like sunflower hearts are used for larger birds and for small birds, ingredients rich in linseed or hemp seed do better. Even if your pet wants to go for an occasional walk, small leaps and hops in the snow are sure to invite frostbites. Then you have the high energy quadrupeds that love daily walks but refuse to wear boots. The paw protection balm will come to your rescue and save your darling pet’s paws on all of his frolics through the tall snow banks as well as on the icy sidewalks. These balms are a mixture of several food-grade waxes and further refined by the manufacturers with their specific formulations. Also, they are safe and non-toxic. Their semi permeable shield allows sweat to escape via the toes. Now that you are well armed with the know-hows to protect your pets in winter, go ahead and buy the products based on their specific requirements before the winter sets in. That ways, you get to hear their loud voices, requests and commands and their winter is sure to be bright and beautiful.